Red-Rimmed Melania (Melanoides tuberculatus)—A Snail in Biscayne National Park, Florida—Harmful Invader or Just a Nuisance? 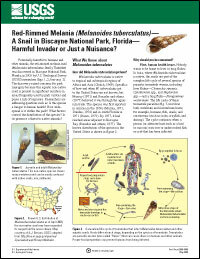 Potentially harmful to humans and other animals, the red-rimmed melania snail (Melanoides tuberculatus; family Thiaridae) was discovered in Biscayne National Park, Florida, in 2003 by U.S. Geological Survey (USGS) researchers. The discovery raised concerns for park managers because this aquatic non-native snail is present in significant numbers in areas frequently used by park visitors and poses a risk of exposure. Researchers are addressing questions such as: Is this species a danger to human health? How widespread is it within the park? What factors control the distribution of the species? Is its presence a threat to native animals? For more information, please contact G. Lynn Wingard.